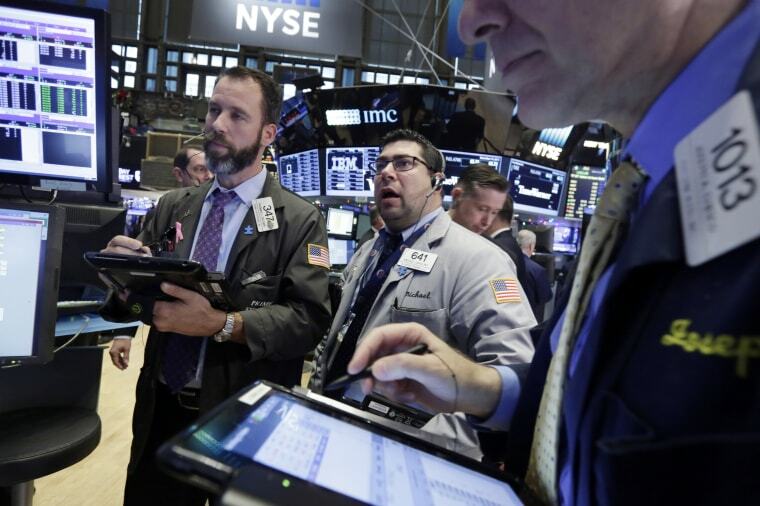 NEW YORK -- Wall Street lost ground on Thursday, leaving the Dow Jones industrial average and the S&P 500 marginally lower at the end of a year marked by record highs as well as a major selloff. The Dow closed down 181.51 points, or 1.03 percent; the S&P 500 lost 19.62 points, or 0.95 percent; and the Nasdaq Composite had dropped 58.44 points, or 1.15 percent. The Nasdaq composite ended the year up more than 5 percent for the year. But the Russell 2000 and Dow transports both had their worst year since 2008, mirroring the performance of the overall Dow average and the S&P. The Standard & Poor's 500 index ended the year down about three-quarters of a percent, ending a three-year streak of double-digit returns. With dividends included the index was up slightly for the year. While the markets ended up nearly flat for the year, there was still plenty of excitement to be enjoyed — or endured — by 2015's biggest winners and losers. It was a year to make old guard companies shudder. New media companies like Netflix, which rose 138 percent to notch the biggest gain in the S&P 500, became more valuable than established media companies like CBS. Amazon eviscerated traditional retailers like Macy's and Walmart. And energy and materials companies were flattened by weak demand at a time of abundant supplies. The biggest loser was Chesapeake Energy, down 77 percent in 2015. Here are the stories behind some of the stock markets biggest winners and losers for 2015. Netflix has enjoyed top billing before: it was the biggest gainer in the S&P 500 in 2010 and 2013, and it more than tripled in value both years. But another big year in 2015 pushed the company's value past established media rivals like CBS and made it about the same as Time Warner. The streaming entertainment service had 69 million subscribers at the end of the third quarter, and almost a quarter of those signed up in the last year. Netflix also continued to win fans for shows like "Orange is the New Black" and "Narcos." The company says its service will be available in 200 countries by the end of the year. E-commerce giant Amazon celebrated its 20th anniversary with results that sent investors into a buying frenzy. Amazon was the second biggest gainer in the S&P 500 for the year, up 121 percent through Wednesday. The company is on track to report more than $100 billion in revenue in 2015 and it has started to turn in higher profits more frequently despite a loss in the first quarter. Its stock surge pushed the company's market value past that of longtime competitor Wal-Mart. Wal-Mart stock fell 29 percent in 2015, which made this Wal-Mart's worst year since 1974, when it had fewer than 100 stores. Wal-Mart was the Dow's biggest loser. "This year seemed to mark an inflection point for Amazon," wrote Christine Short, an analyst at Estimize, who said Amazon was "almost solely responsible for the downfall of big box giant Wal-Mart." Macy's and Staples also were among the 20 biggest losers as fewer shoppers trekked to stores and bought more goods online instead. Amazon is now in a battle with the other high-flying stock of 2015: Amazon and Netflix are rivals in creating original entertainment for subscribers. This year the two snagged almost 50 Primetime Emmy nominations between them. Netflix shows received far more nominations but Amazon's shows won five Emmys to Netflix's four. The third biggest gainer in the S&P 500 was Activision Blizzard, the video game maker behind "Call of Duty" and "World of Warcraft." It rose 91 percent as it moved to expand into the sweeter side of games. In November the company agreed to buy King Entertainment, the maker of the smartphone hit "Candy Crush Saga," to strengthen its mobile games business. It is also working on a "World of Warcraft" movie and a TV show adapted from its kid-focused "Skylanders" game. The rest of the top ten winners in the index were a mix of companies representing several industries, including the video graphics chip maker NVIDIA, the payments processor Total System Services, the website domain name company VeriSign, and Spam maker Hormel Foods. First Solar also made the top 10, getting a major boost when Congress extended tax breaks for solar installations in December. Seven of the 10 biggest losers in the S&P 500 were energy companies, led by Chesapeake Energy, Consol Energy and Southwestern Energy. All three are dependent on the price of natural gas and all fell between 75 percent and 80 percent this year. Nine energy companies in the index lost at least half their value. A big reason: Mother Nature. An extraordinarily warm fall and early winter in the U.S. is slashing demand for heating, and half the nation uses natural gas to heat their homes. Natural gas supplies were already high coming into the winter. That combined with low demand pushed natural gas prices to their lowest levels since 1999 in mid-December. The rout in crude oil prices that began in mid-2014 deepened in 2015, pulling down the value of oil company shares and the performance of the overall stock market. All this pain for energy companies is good for consumers, who are now enjoying low prices for gasoline and shrinking heating bills. There were three non-energy losers in the S&P's bottom 10. Mining company Freeport-McMoRan fell 71 percent, hurt by slowing economic growth in China that reduced demand for raw materials. Watchmaker Fossil Group lost nearly two-thirds of its value as fitness trackers grew more popular and the Apple Watch was launched. Chipmaker Micron Technology fell 60 percent as consumers continued to turn away from personal computers.